Need help with a drinking problem? Reach out. We're here for you. Connect with an AA member online now. AA members worldwide are available now to help by email. Fast, confidential responses. Email, chat, audio, and forum meetings in a variety of languages are in progress. Call 336-854-4278 to speak with an AA member. If you want to stop drinking, need help finding a meeting, or want more information about Alcoholics Anonymous, call us anytime to be connected to an AA member. Download and print a meeting schedule. Same info as our online schedule with plenty of space for phone numbers. Get notified of site updates. 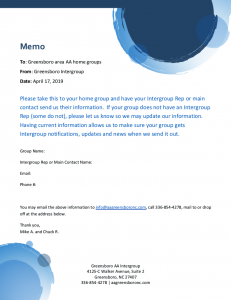 Greensboro Intergroup requests Greensboro area AA groups update their Intergroup Rep contact information. 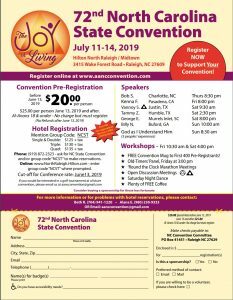 Email the requested information to info@aagreensboronc.com, call 336-854-4278, or download the memo to print and mail or drop off at their office. The District Committee Meeting Minutes – April 11, 2019 are now available on the Documents page. Due to event at the church during the week of May 6th, It’s in the Book’s Women’s Group will not be meeting on Tuesday may 7th or Saturday May 11th. In addition to their Tuesday night meeting date, Live and Let Live will also be meeting on Sunday nights at 6pm in the LGBTQ Center of Greensboro in Suite 226. The Sunday meeting replaces their Thursday 7PM meeting. Please come out and help them celebrate this new addition and Greensboro’s only Grapevine meeting. The address for the LGBTQ Center is 2205 W. Bessemer Avenue. Some groups in District 23 have asked about ways to accept non-cash 7th Tradition contributions. 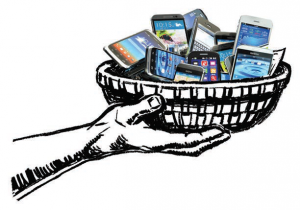 As more and more of us carry less and less cash, being able to accept digital contributions has become a topic of conversation in many home group business meetings and at other levels of AA service. A good starting place to get informed about options is this set of Digital Contribution FAQs, produced by the Intercounty Fellowship of Alcoholics Anonymous in San Francisco and Marin counties in California. Additionally, you may review page 3 of Winter 2017 edition of Box 459 from aa.org. Should your home group decide to explore these and other options, we invite your GSR or any representative of your group to the monthly district meeting (2nd Thursday @ 6:30PM – see events) to share what you find and ask questions. 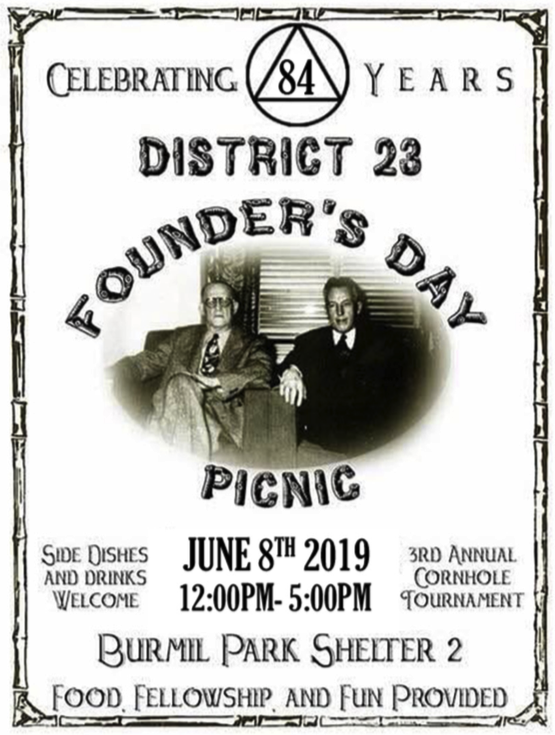 To learn more about and/or stand for a position, please contact the DCM and attend the next District Committee Meeting (GSR Meeting).